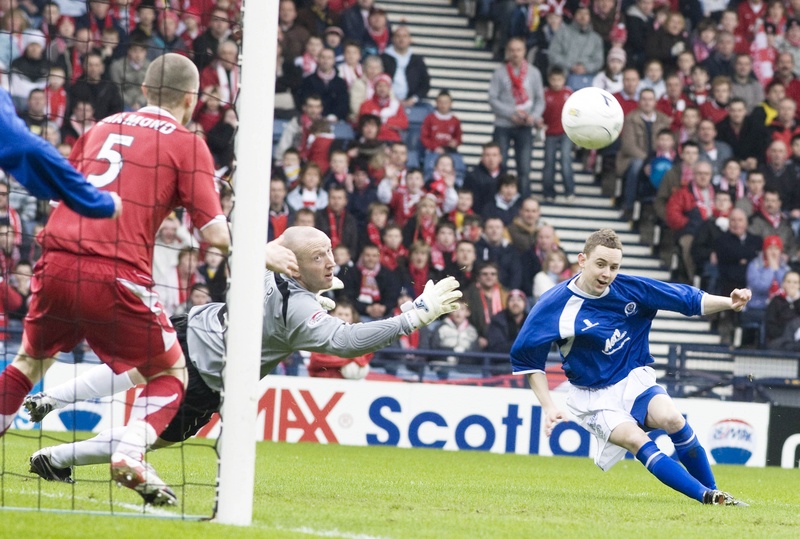 Andy Considine nets the second goal against Queen of the South in 2008. Andy Considine will have a crucial role to play in this weekend’s Scottish Cup tie with Queen of the South, according to former goalkeeper Derek Soutar. Aberdeen defender Considine is the one remaining player from the 2008 semi-final the Dons lost against Queen of the South at Hampden Park, ahead of their meeting in the fifth round at Pittodrie on Sunday. Two goals from the then-21-year-old were not enough to spare Aberdeen from a surprise exit at the last-four stage, with ex-Don John Stewart scoring the decisive goal in a 4-3 win for the Doonhamers. Soutar played in goal for Jimmy Calderwood’s side in Glasgow on that day 11 years ago and if a repeat upset is to be avoided, Soutar reckons Considine will have a big say. He said: “He has the experience from 11 years ago and will go that extra bit for you and the team. They may need him to put his body on the line. He’s such a reliable person – he’s Aberdeen born and bred and so level-headed. Considine is out of contract at the end of the season and Soutar feels the onus is on the Dons to keep him around. Soutar added: “They would be silly not to offer him something. Even if he’s not going to be a first-choice centre-half, he’s great to have around the club and the dressing room. Paul Burns (right) fires the ball beyond Derek Soutar and Zander Diamond to put Queen of the South 2-1 up. Soutar, who also played for Alloa, Brechin City, Dundee and Ross County, does not foresee a repeat result at Pittodrie this weekend, paying tribute to the squad Derek McInnes and Tony Docherty have assembled. He said: “They will know who their danger men are and their weaknesses. Derek and Tony have not achieved what they have at Aberdeen without hard work, so complacency won’t come into it. “I played with Stephen Dobbie in a couple of Scotland youth squads. To have the goal tally he has is incredible. He’s stuck two fingers up to a lot of people up here who had maybe written him off after he went to England. He’s admitted it himself he lived his life wrong when he was younger and hasn’t had the career he could have.